. : Lunar Palace v.5 - Manga: Sailor Pluto :. Pluto holds the key to the Fourth Dimension, she is also guardian of the underworld and time. It is forbidden to know that she exists. Her duty is to execute anyone who gets near the Gate of Time. Pluto only smiles for Small Lady and she's always a little sad. These are the three taboos that Pluto must never break; 1) Time Travel must not be allowed, 2) She muet not leave her post, she must guard The Gate of Time, 3) She must never stop time. If Pluto stops time she will destroy herself. Pluto's wish was she has always wanted to help Sailor Moon and fight by her side. Sailor Moon has always been Sailor Pluto's idol. The Story of Sailor Pluto: "She has the blood of the God of time, Chronos in her veins. The beautiful solitary guardian of the gates of the underworld, she lives between one time and another. Time is the last sacred territory. From long ago, Sailor Pluto has been guarding the gates to that forbidden land. Sailor Pluto has lived longer than anyone, and has seen many eras. She is a reliable scout with excellent judgment and more endurance than anyone." 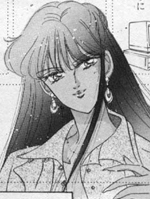 Setsuna is a freshman in the Physical Sciences and she is majoring in the oretics of elementa science.